Microsoft would like everyone to just forget all about that Xbox 720 design document business. The 52-page Xbox 720 design doc that bubbled to the surface of the internet a few days ago was greeted with great skepticism, and for good reason. 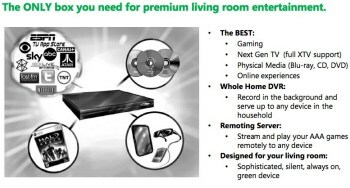 It pretty much promised the world for 300 bucks, with eight CPU cores plus three more dedicated to backward-compatibility, 3D support, cloud gaming, a hi-res Kinect system capable of handing four players simultaneously and whole bunch of other stuff intended to make it a "true all-in-one home entertainment box" - not a bad deal for something that was conceived in 2010. Microsoft hasn't commented on the document either way, but it has reacted in a fashion that could be seen as legitimizing the document: it's doing its very best to wash that plan right out of the internet. It was first pulled from Scribd at the request of law firm Covington & Burling LLP, but Ihned.cz has also received a takedown notice, as has Dropbox, which is now blocking its users from publicly sharing the doc. It's an effort that's almost certainly doomed to futility, not only because what happens on the internet stays on the internet, but because anyone who actually cares about this sort of thing is already aware of all the salient points. Microsoft could be reacting this way as a matter of principle, I suppose, or maybe it thinks there's still a chance to keep the information from drifting past the eyeballs of its more casual fan base; or maybe it sees this as an opportunity to put the Streisand Effect to work for its own purposes. Whatever the case, I wouldn't go nearly as far as sites like Metro, which extrapolated the takedown notices as an outright admission that the document is real. But why would Microsoft put so much effort into neuralyzing the entire internet if it's just a hoax? The plot, as they say, is thickening.